Beverages in Singapore are quite standard. You can easily find various colas and carbonated drinks everywhere. It is important to keep hydrated when touring around Singapore. I had become dehydrated a few times and finding a place to get a drink wasn’t difficult. The one surprise I had was that you had to find an actual shop. Tokyo has spoiled me as I can just go a block or so and find a vending machine to get a drink. It is so easy to find them, but in Singapore, I had to look around a bit for a convenience store to get one. While there are convenience stores everywhere, it isn’t always easy to spot them and you can get a bit of bad luck by zig-zagging and missing them all. I was pleasantly surprised to find bubble tea shops around Singapore. While I wasn’t expecting the best, I did try one. I ordered a simple milk tea with pearls and was asked about the sweetness level. I said, non-sweet, and the clerk was surprised. Living in Japan, tea is rarely sweetened and when I went to Taiwan earlier in the year, the bubble tea was unsweetened. While I like both, on a very hot day, I actually prefer unsweetened to feel more refreshed. While the bubble tea was just average, I think I can see why people like it sweetened. The tea didn’t taste as great and the sweetness could mask the imperfect taste. In fact, I found it impossible to find unsweetened tea in Singapore as they take the western tradition that any cold tea has to be sweetened. Alcohol in Singapore is something that is a bit strange. Alcohol is easy to find and purchase. You can easily buy alcohol at any convenience store and supermarket but it isn’t that cheap. It isn’t expensive either but when you go to a restaurant or club, it can feel astronomical. The lunch time specials, called “happy hour”, provide 2 for 1 or 50% off drink deals. In fact, these deals tended to last from lunch till dinner, rather than just an hour. After this happy hour, prices are scaled up to “regular” price. One of the most common types of price scaling was a happy hour from open till dinner; then dinner time; then regular price after dinner. This made drinking a little expensive but if you stuck to drinking in the afternoon, it was very reasonable. The selection was also interesting. You can really feel the influence of western nations as most of the beer was imports from other countries. While there were regional brews such as Tiger beer and other nearby specialties, it was tough to determine what was local and what was foreign. I try to support the local economy but in Singapore, I decided to support the European community by trying various beers from Europe. 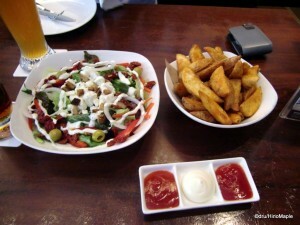 Western food is also very common in Singapore. It is very easy to find McDonald’s but it is also easy to find various pubs and bars as well. I love to visit nice brewpubs wherever I go. In Taiwan, I had a few drinks in the gay district and had a good time there. In Vancouver, I often go to pubs where I grab a burger and a beer. In Tokyo, I often go to various izakaya and drink till the sun comes up. In Singapore, I found the drinking experience to be more like Vancouver where you have nice brewpubs, but also like Taiwan where you can have outdoor terraces with many drinks being served. Alcohol is still a very western ideal in Singapore. Muslims are very strict at not drinking alcohol and I have found Chinese people don’t often drink too much, especially with family. 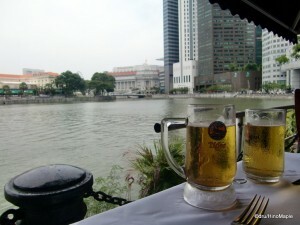 I read that Singapore frowns upon public drunkenness so I kept myself in check. Most of the western style restaurants have to cater to those who drink alcohol as that is what is expected in many restaurants. Whether it is a bottle of wine or a pint of beer, people enjoy a little alcohol with their meal and Muslim Singaporeans respect that. Singapore is not just about the foods that I have mentioned. I did see a lot of Japanese restaurants and I feel that they must be delicious, albeit a bit overpriced compared to Tokyo. I also saw many other places selling foods that I never had a chance to try. 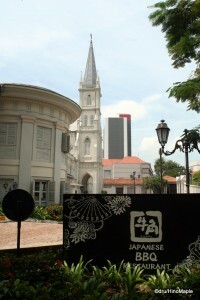 You can spend days exploring Singapore and trying various types of food. It is a matter of making time to go out and try new things that is difficult, especially when you also want to see everything else that is out there. You can spend a small fortune eating if you want or save a lot by going to the Hawker’s markets. It really depends on your personality and your budget. 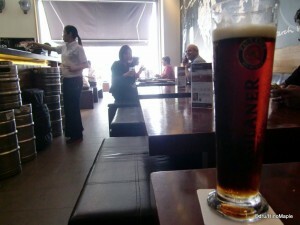 This entry was posted in East Asia Food and tagged alcohol, beer, beverage, Bubble Tea, drink, food, German Beer, happy hour, McDonalds, Singapore, Singaporean Food, Taiwan, Tiger Beer, western food by Dru. Bookmark the permalink. 😀 Happy to support the Europeans. b(^^)d You’ll have to enlighten me about the local brands in KL before I go. It’s too early to get excited about that trip but I will once the new year season has finished. oh crap. I know nuts about the beers in Malaysia.